I have often grumbled that cartoons these days aren’t nearly as awesome as the Roadrunner cartoons. Now that everything has to be politically correct, blowing up a coyote or causing him to fall down a cliff is apparently damaging fragile young minds. Personally, I think cartoons are just lacking those big cheesy explosions. The ones with round bombs and long fuses that always seem to malfunction at bad moments. 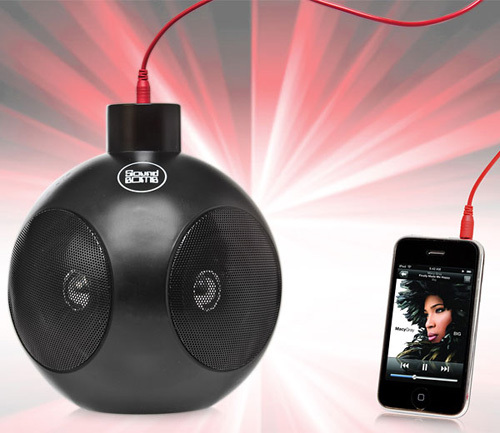 Well you can show your love of those classic moments with this Big Bang Speaker. Which very much resembles a very cartoonish bomb. It even comes with the bright red cord that happens to stick out of the top, making it look like an already lit fuse. It will work with any portable sound system just as long as it has a headphone socket. To keep it powered up you can use either 4 AA batteries or opt for charging it up through your USB port. You can purchase the Big Bang Speaker for £29.99 or about $49 from I Want One of Those.